Reuters reports that Galina Vishnevskaya, the Russian soprano whose voice entranced composer Benjamin Britten and persuaded violinist Mstislav Rostropovich to become her third husband has died at the age of 86. As a teenager, Vishnevskaya came to prominence shortly after World War Two and by the 1960s had become an international opera sensation filling some of the world’s greatest theaters. Her talents were so mesmerizing that British composer Britten wrote the soprano part of his “War Requiem” especially for her and Russian composer Dmitri Shostakovich chose her for a renowned rendition of his opera Lady Macbeth of Mtsensk. 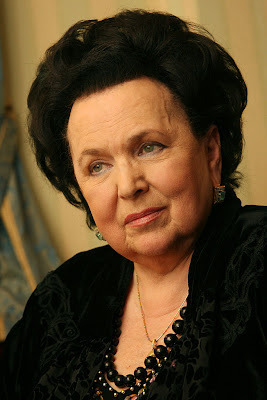 “Vishnevskaya was a flag-bearer of Russian culture, a singer of the highest rank,” Georgian-born tenor Zurab Sotkilava told Kommersant daily newspaper. Tributes from President Vladimir Putin, Prime Minister Dmitry Medvedev and others appeared in the Russian media quickly for a singer born in the Soviet city then known as Leningrad (St. Petersburg), who went on to live a life nearly as dramatic as some of the roles she sang on stage. Vishnevskaya took to the local stage for the first time at the age of 18 - going on to enchant audiences as one of the lead soloists at Moscow’s prestigious Bolshoi theatre where she sang some 30 different roles. The theatre held a moment of silence in her honor before Tuesday’s performance of Turandot. The Soviet authorities forced the singer and her husband Rostropovich to flee the country in 1974 for supporting Nobel prize-winning dissident writer Alexander Solzhenitsyn. After being forced to flee, every video recording of Vishnevskaya's performances were destroyed. She lived, performed and directed opera in the United States and France until 1982. After returning home, Vishnevskaya wrote the autobiography “Galina” in which she openly criticizes the Soviet authorities. Aida, Eugene Onegin, Tosca and Madame Butterfly were just a few of her crowning roles. During her career, Vishnevskaya was awarded some of the most prestigious Russian and foreign medals, including the medal "For the Defense of Leningrad" and orders "For Merit to the Fatherland", third and second class. Vishnevskaya opened her own opera center in Moscow in 2002 where she remained Artistic Director until her passing.